Music is everywhere. But how we listen has always evolved over the years; the method becomes more convenient, portable, and large-scale. One of the ways people listen to music is through the use of iPod. Apple iPods are becoming the number one way people listen to music, especially when they're on the go. iPods, with their fantastic and ultramodern design with mind-blowing features, are making a huge impact around the world. With their feather-light weight and credit card size, you can easily restore music from the iPod to iTunes library for those who use Apple phones. For those who want their music everywhere they go, this is the best option out there. Your iTunes library probably may contain a different collection of media, from music and videos to podcasts which often times represent years of collecting, especially music which is the main reason while you need to back up your PC and your iTunes library from time to time. But no matter how often you back up your data, something could go wrong. 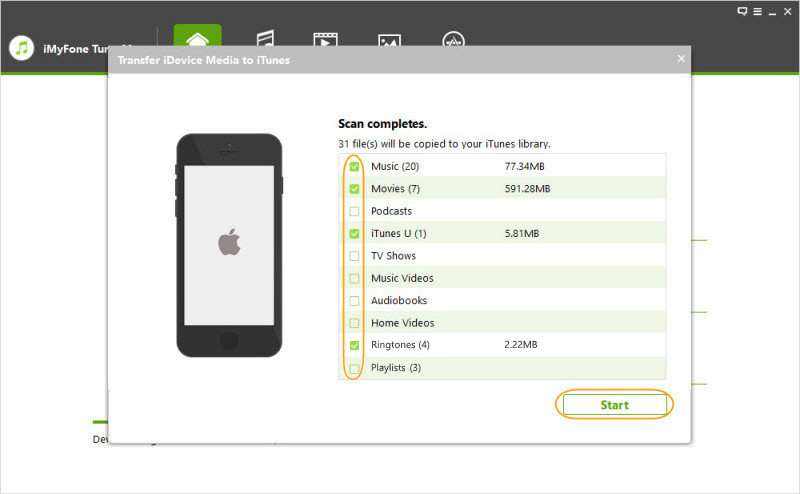 That's why you should go through this method to help you restore much of your iTunes music library by using your iPod. Open iTunes on your PC and then plug in your iPod. To stop your iPod from syncing automatically, select “Edit > Preferences > Devices”, tick the box that says “Prevent iPods, iPhones and iPads from syncing automatically” and click “OK” to save the settings. Open "Computer", you will see your iPod is shown as a disk. Click "Tools > Folder option > Show hidden files and folders" on ribbon and then click "Ok". Go into the iPod disk and open "iPod-Control". Find the music folder and copy it to desktop. Back to iTunes, select "Edit > Preferences > Advanced". Tick "Keep iTunes music folder organized" and "Copy files to iTunes music folder when adding to library", then click “OK”. Select "File > Add to library". Choose the music folder from the desktop and add it to iTunes library. By doing so, all your music will be imported back to the iTunes Library. 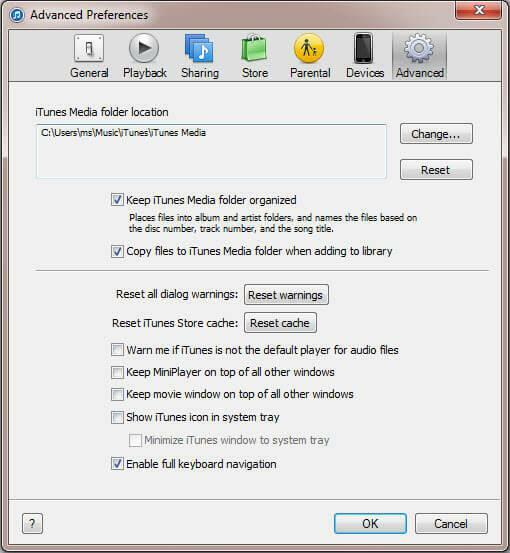 You will have to go to Import songs within iTunes, manually select all of the songs within all the folders (under "music" as described above) then proceed for those with Window Vista and later versions. iTunes may not let you drag and drop directly, you can just copy and paste the music folder to desktop and add it from the iTunes menu. You can’t select individual files for transferring, you can only sync. On top of that, you can only share data with 5 devices and it only supports purchased music from the iTunes store. There are different ways one can restore music from iPod to iTunes but I will discuss just one way which is by using iMyFone TunesMate. iMyFone TunesMate is a great third-party application that allows you to have a lot of control over your music. You can transfer songs from iPod to iTunes library very easily. You can rebuild your iTunes music library with different iDevices. Unlike iTunes which can only detect 5 iOS devices, TunesMate do not have the restriction for how many devices can be used to transfer. With just a few clicks, you can copy music from your iPod to iTunes. Step 1: Install and launch TunesMate, then connect your iPod to computer. Step 2: When your iPod is shown on the interface. Click “Transfer iDevice Media to iTunes” and hit "Start" button. Step 3: Tick "Music" and click “Start” to begin. Here “Transfer iDevice Media to iTunes” can only help you to add all the music to iTunes at one time. If you need to add individual music selectively, you can follow the guide below. Step 1: As before, launch TunesMate, then connect your iPod to computer. Step 2: Tap “Music” and choose the music you want to transfer to iTunes. 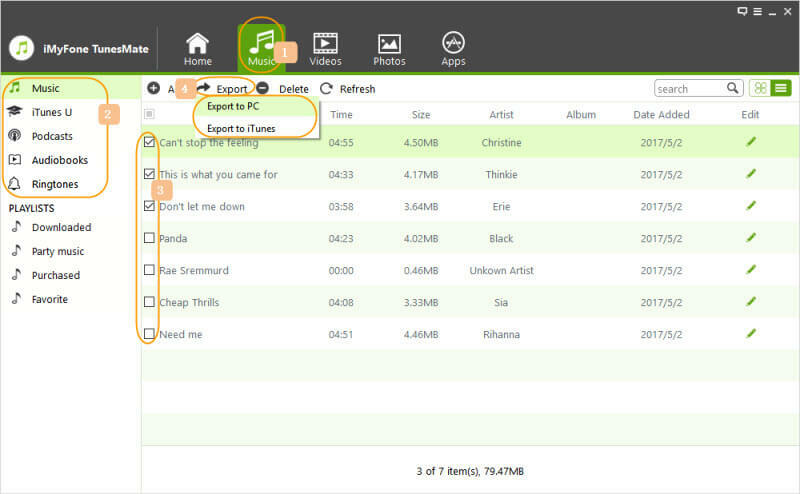 Step 3: Click on “Export” and choose “Export to iTunes”, the songs will be transferred to iTunes as soon as possible. iMyFone TunesMate is an overall iDevice manager that offers many features and has huge advantages over iTunes alone. 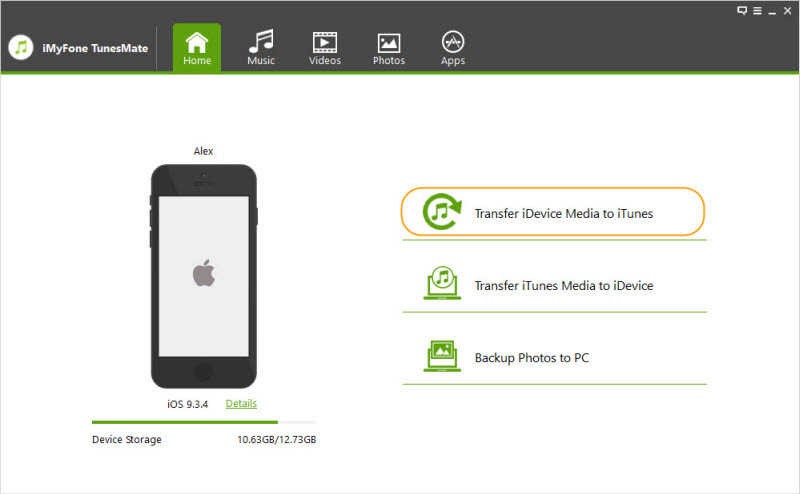 It can help you transfer with more than just music, all kinds of files like photos, movies, playlists, and other media files can be easily transferred between iDecices and iTunes/PC.